Most NZ organisations lack programmes to manage the 'consumerisation of IT' trend. Consumerisation of technology – where workers use their own smartphones, tablets and social media like Facebook and Twitter for work – is accelerating in New Zealand. But the majority of employers have not yet implemented programmes to proactively manage, support and secure these devices. This means the trend, often referred to as ‘consumerisation of technology’ and ‘rogue IT’, is largely driven by employees. These are among the key findings of the second annual Consumerisation of IT survey conducted by IDC for Unisys. The global survey covered 25 employers in New Zealand – and interviewed both senior executives and staff. Interestingly, the research finds a striking gap between what devices and social media employees say they now use for work, and what management thinks they are using. For instance, 8 percent of iWorkers say they use iPads and other tablets for work, but employers say only 4 percent of their employees do so; 14 percent of workers say they use iPhones for work but their bosses say the figure is only 11 percent. More than a third (37 percent) of staff say they use social media for employee communication, but employers believe the figure is only 17 percent. The rise of tablets cropped up in the survey. 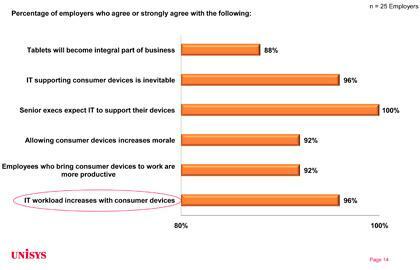 This year, 7 percent of employees say the iPad and other tablets are critical for work – last year the figures were zero. Brett Hodgson, managing director of Unisys New Zealand, says the impact of consumerisation of technology is not slowing down and employers have a huge amount of catching up to do before they can get get control of what is in their environment. He says few employers have taken steps to mitigate the security risks arising from the trend, provide support models for these devices, or modernise or customise apps for use in these devices. He points out the challenge is exacerbated by the fact that employers have so many competing urgent priorities they don’t know where to start, and they are constrained by lack of resources and budget. Employers say the top three barriers for adopting an official Bring you Own Technology (BYOT) programme as security concerns (87 percent), viruses from social networks (68 percent) and challenges in developing corporate policies (53 percent). The issue, however, is not just for IT departments. He advises creating a task force with representatives from across the organisation including IT, legal, HR, operations and procurement to draw up the the CIO, legal, HR, operations and procurement – to draw up the policy and enforcement programmes. Finding out what is being used now and secure it with technology and policies to prevent business critical data being compromised. Determining which tools will provide greater productivity gains. Deciding how to manage devices and support users most effectively and include self service support models.